Today’s “Three Gems from the Web” series is about people. Through this I want to underline that the Internet can be used to meet people and get inspired, not only to search for facts or information. Of course, most of the time, these meetings are not proper two-way interactions, although at some point, this can become true as well. Nevertheless, if you are on the look for models, inspiring and successful people that are willing to share their core ideas, the web is full of them. Here are my picks. They are all women, they are all positive and they all know what they are talking about because they have put in the hours, day, months and years to master their professions. 2. Elisabeth Gilbert: – again, an author, and one that you probably know very well. 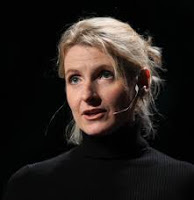 She is the author of the bestseller “Eat, Pray, Love” but she is now again in the public eye because of her new book called “Big Magic – creative living without fear”. I listened to her book on Audibles, it is narrated by Gilbert herself, and as a consequence, I feel her now as a close friend. She is so personable, sensitive, yet inspiring and strong, and her new topic is so close to my current obsessions that I had to include her. As a follow up to her book, she launched a series of podcasts that continue her conversation about creativity with people struggling with it. You can find them on SoundCloud or iTunes or on her website. And, by the way, one of her interviews on her podcast is with Brene Brown. 3. Marie Forleo: – is the host of MarieTV, entrepreneur and life coach. The reason I include her here is that she has inspired me with her joyful personality and positive attitude towards life. I’ve met her on her YouTube channel and then continued to watch her and meet her on various other platforms. Her content is about entrepreneurship and mainly addresses self-starters and small businesses. Her added value is sheer inspiration and great spot on advice. Enjoy these three beautiful persons or whomever you decide to discover on the Internet! ← How to stay safe on social media?